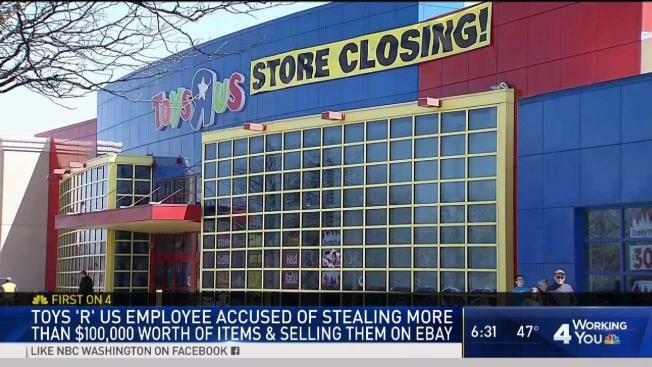 A former Toys R Us employee is accused of stealing more than $100,000 worth of toys and other merchandise, and reselling it on eBay. Obaid Sheikh, 25, worked at the Toy R Us at the Fair Lakes shopping center in Fairfax, Virginia. He has been charged with embezzlement, selling stolen property and conducting an unlawful financial transaction. Mike Monaghan, the store asset protection manager, began an investigation into thefts at the store last October, a search warrant affidavit revealed. He discovered that toys marketed as "Toys R Us exclusives" were being sold by an eBay account. Monaghan tracked the eBay account to Sheikh, an employee who had been working at the Fair Lakes store for four years. His eBay account had generated $123,000 in revenue with sales of nearly 3,000 items, court documents say. When Sheikh was confronted, he admitted he'd taken the items out of the store through the back door and put them in his vehicle's trunk, a search warrant says. Monaghan then turned the investigation over to Fairfax County police. investigators searched Sheikh's home and found a variety of Toys R Us merchandise and bags. Sheikh told authorities he decided to steal from the store because he felt mistreated, a detective handling the case wrote. Sheikh also told the detective he had $80,000 in a bank account and was using the proceeds from the stolen merchandise sales, in part, for his college education. The detective said Sheikh then turned over $185.88 worth of merchandise he'd just stolen that was still in his car.